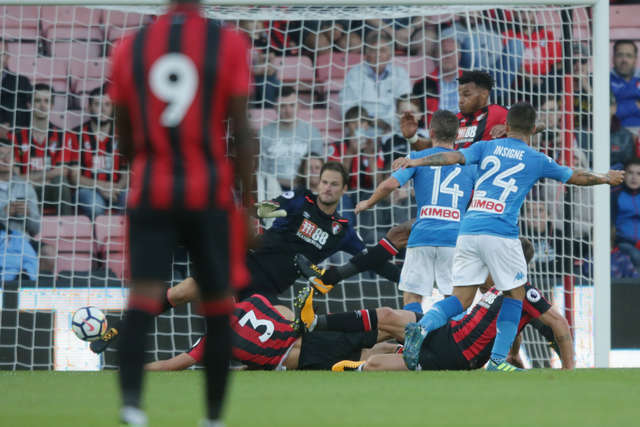 Bournemouth and Napoli play out entertaining friendly to close the Cherries' pre-season schedule. Dries Mertens’ goal gave the Italians a half-time lead, but in a much-improved second period performance strikes from Benik Afobe and Simon Francis claimed a lead for the Cherries. With less than seven minutes remaining the Italians drew level, substitute Piotr Zielinski finishing to end the game on level terms. Manager Eddie Howe named a strong side for the Cherries’ final match of pre-season, six days before the Premier League start at West Brom next Saturday. The match was fast in tempo from the kick off, Napoli’s stars soon impressing with their quick ball movement. Backed by their loud band of supporters, Napoli defender Kalidou Koulibaly headed a couple of yards over following a corner after four minutes, the visitors quickly out of the blocks at Vitality Stadium. 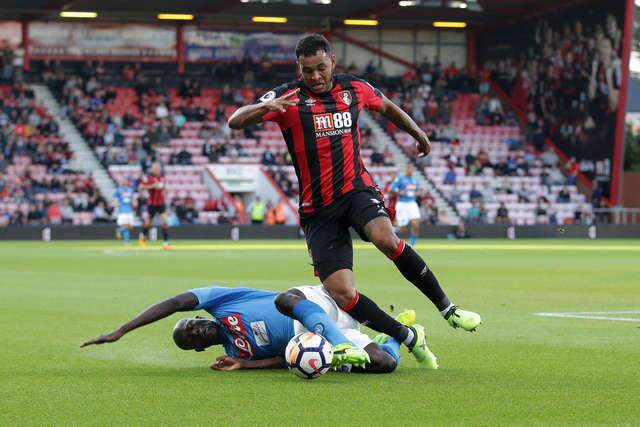 Full-back Faiuzi Ghoulam hooked a low shot well wide, and three minutes later was handed another chance as Bournemouth struggled to clear their lines, this time the Algerian mistiming a volley that fell easily for Begovic. The Bosnia international ‘keeper then needed to be at his best, stretching to take the sting out of Jose Callejon’s instinctive shot, Tyrone Mings recovering and clearing off the line. Insigne’s shot from 25 yards was comfortable for Begovic, while at the other end Jordon Ibe’s forward surge was stopped by the Napoli backline only as he closed in on the six-yard box. After a corner caused momentary havoc in the Napoli penalty area Begovic was again forced into a save for the hosts, comfortably palming away Insigne’s inswinging shot from 19 yards. Midway through the half and Bournemouth were looking increasingly settled. When the Cherries stole back possession Joshua King rapidly freed Ibe, but downfield and looking for a return to finish off the move, the low cross back towards the Norwegian was blocked away. The Italians retained their danger in attack and after captain Marek Hamsik miscued from a good position in the area, they took the lead. Begovic’s poor clearance allowed Callejon to find Insigne with space to shoot in the area, and via a crucial Mertens deflection the away side had a 30th-minute lead. Five minutes after the opener, Begovic went some way to making amends as he got down sharply and blocked behind Mertens’ shot following a slide-rule pass to set the Belgian free. 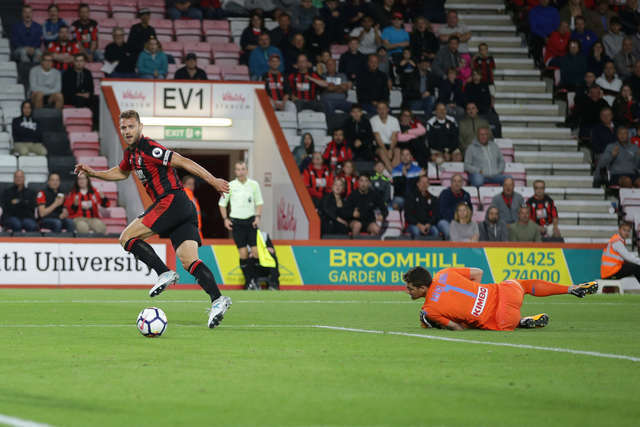 Begovic was soon down quickly again to foil Mertens’ low strike following a deft dummy, the Cherries able to see the game to the interval with just a one-goal deficit. A hobbling Steve Cook was replaced by Jack Simpson within two minutes of the restart while a fierce Max Gradel shot looked to redress the balance on the scoreboard but was blocked. On 52 minutes the equaliser did arrive, Gradel playing a key role as the Cherries pulled themselves level. 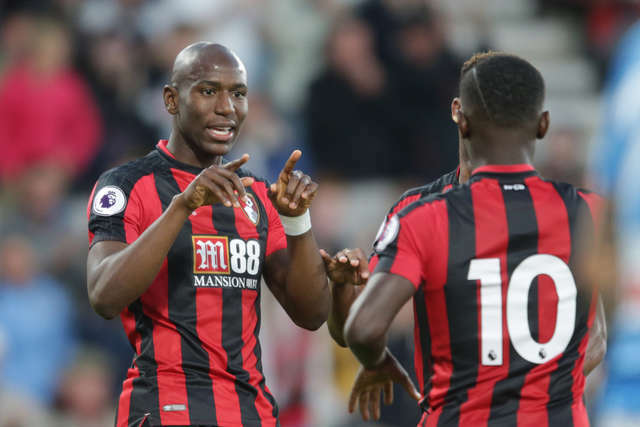 Played into the left side of the box, the Ivorian dropped a shoulder and shot across goal, a desperate defensive block deflecting the ball up and neatly onto the head of Afobe who converted from close range; his fourth goal of a profitable pre-season. The game bursting into life, half-time substitute Artur Boruc was at his best to keep out first Mertens and then Insigne’s follow up, both from close in on goal. But it was the Cherries with increased belief and purpose - Pepe Reina would have been relieved that King’s low strike was directed at his feet as the hosts pushed forwards at pace. Boruc was still required to earn his corn just past the hour mark, saving from Insigne then seeing Callejon’s delicate chip land on the roof of his goal. Lewis Cook whistled a ferocious bouncing drive just wide of the upright, before Dan Gosling’s curling effort swerved comfortably back into the palms of Napoli’s substitute ‘keeper Rafael Cabral. With 15 minutes left the Cherries completed the turnaround, Francis the unlikely scorer as he neatly rounded the ‘keeper for his side’s second. There was a tinge of controversy about the goal, however, the Napoli players rushing to tell the referee that Gradel had pushed an away defender in the build-up. The Cherries were in control with the clock ticking down, but on 83 minutes the scores were levelled again when Zielinski slotted home after a the ball bobbled around in the box following a dangerous cross. The game finished with King's shot flying just wide after a defection, both side settling for a tie in a high-quality pre-season contest.